We just got the new Nemo Ditto shopping totes in stock, and I must say, these things are sweet! 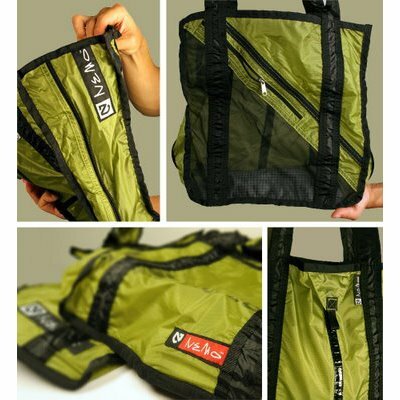 Rather than sending the defective tents and tent samples to a landfill, Nemo sent these off to be converted into a one of a kind, recycled shopping tote. They are made from the same lightweight and durable materials as their tents, and the only new materials used in the construction of these is the thread and edge binding. So these Ditto bags are GREEN, and I’m not talking about the color. Also, no two bags are alike, so you can pick one up for everyone in the family and there won’t be any fighting over who’s is who’s.